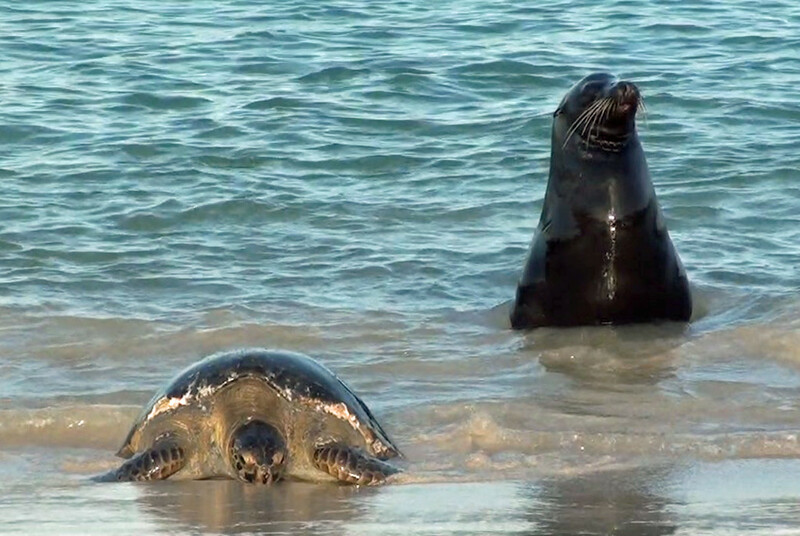 Sea Lion Surprise On Sante Fe island, Galapagos Islands! “Always there is something happening in the Galapagos islands” Never a truer word spoken from our tour guide! Just moments earlier, a sea turtle had landed on the beach we were sitting on and was welcomed by an inquisitive sea lion. Upon discovering that the beach was covered by hundreds of sea lions, and thinking better of making land, our turtle friend turned around and headed out to the more tranquil waters of the bay! Only on the Galapagos! Visiting the Galapagos comes with a lot of responsibility, and just like our trip to Antarctica, we were always wary of the animals who were unafraid of us. Obviously the main rule was to keep your distance and never touch the animals, ever! With our guide and a responsible group, we were glad to avoid any of these pitfalls, especially when iguanas would come and say hello as you were taking a break! Or giant tortoises disguised as rocks sitting in the middle of the path, we were always wary.